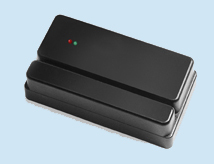 PIV-II reader with optional barcode and magnetic stripe. Supports all PIV-II compatible cards including TWIC cards containing a PIV-II application. The Smart PIV is a decoded RF reader for reading PIV-II compatible cards. The Smart PIV reader can also be ordered with optional barcode and magnetic stripe reading capability. The reader is available in many different industry standard interfaces, is programmable, and available with a variety of options, such as leds, relays, and door sense inputs.